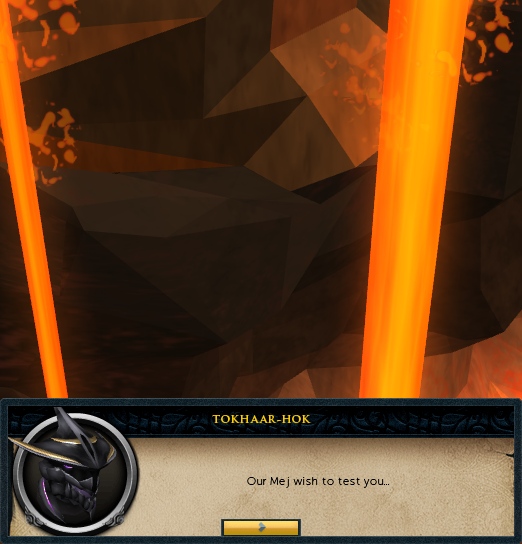 "The Kiln is where TzHaar were first made. Its sacred lava is able to give life, melt the hardest of metals and even restore the memories of our lost ancestors." 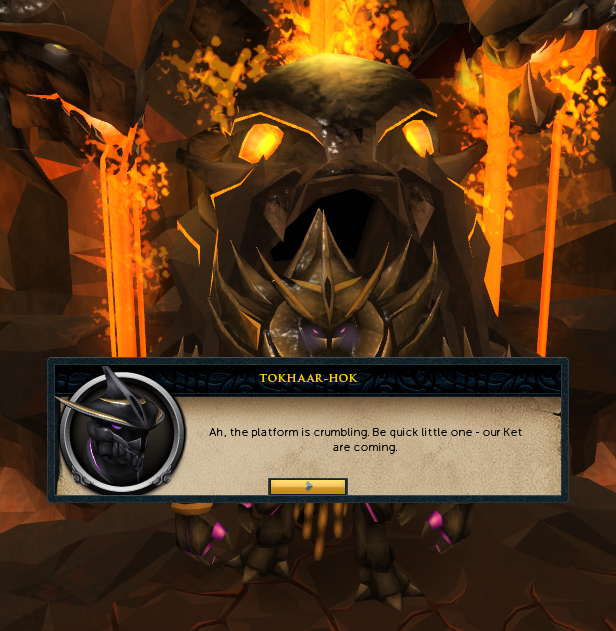 The Fight Kiln is a mini-game unlocked upon sacrificing a Fire Cape after the completion of the Master Quest, the Elder Kiln. 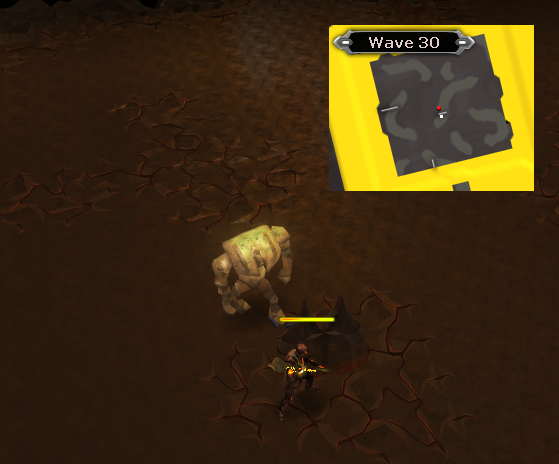 It is the harder version of the Fight Caves, and as such, requires some strategy before attempting to endure all 37 waves of creatures. 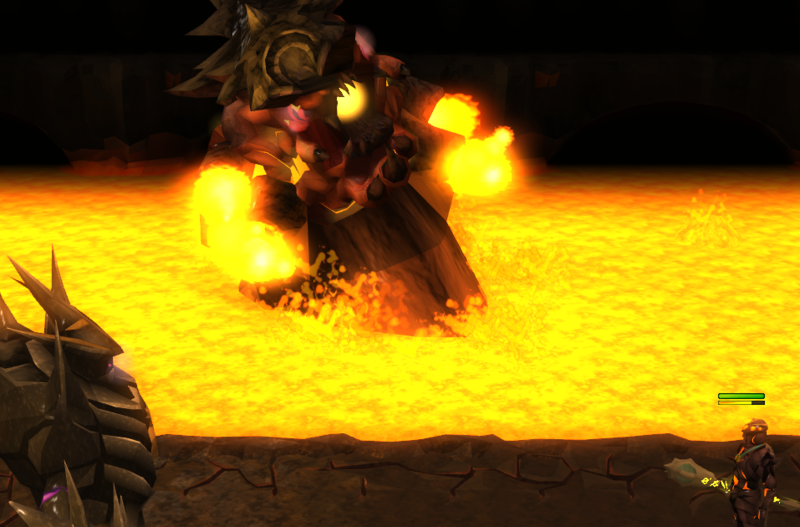 The Kiln, located east of the TzHaar main plaza, is home to among the highest hitting creatures in all of RuneScape, so take caution before entering. One lucky hit from a TokHaar-Jad can undo hours of hard work and planning. Completion of The Elder Kiln quest- Required for entry. 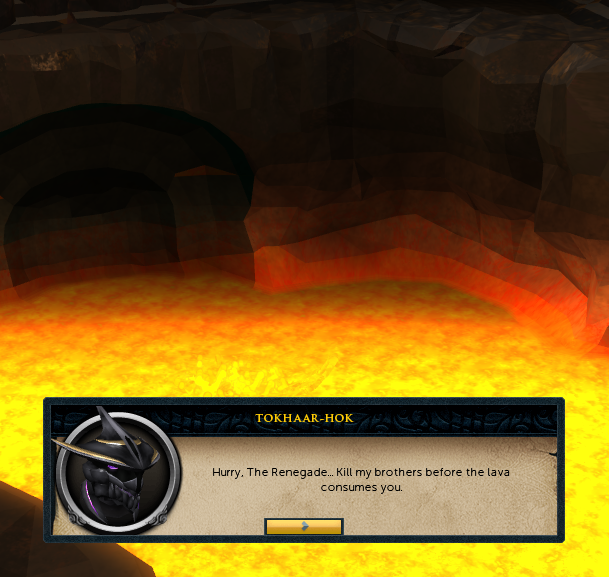 Completion of The Fight Caves at least once- You must sacrifice a Fire Cape to unlock the mini-game. Note that this is a ONE-TIME sacrifice. Completion of The Brink of Extinction- Unlocks Obsidian armour, which dramatically reduces the damage you take from the creatures. The Obsidian armour (without the Kiteshield) absorbs 45% of all incoming damage. Obsidian Armour is obtained via the Fight Cauldron minigame, which is unlocked after completing the Brink of Extinction. Having atleast a Rune Pickaxe in your toolbelt: After a hidden update, players no longer need to bring a pickaxe in their inventory to break the Dill's shell. Overload Potions: An Overload is ideal for the Fight Kiln, as it boosts all your combat stats and dramatically increases your accuracy. 92+ Prayer: The Soul Split curse, in conjunction with Obsidian armour and a familiar, can allow you to AFK the vast majority of the Fight Kiln. It also saves you a great deal of supplies. 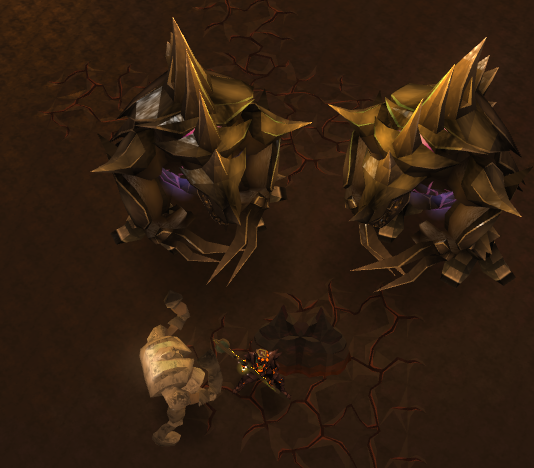 95+ Summoning: The Iron Titan and Steel Titan familiars are definitely worth bringing into the Kiln. Not only can they damage the Dills without your needing to use a pickaxe on them, the TokHaar are extremely weak to their attacks. 1 Steel of Legends scroll can usually dispatch a monster at full health. The Vampyrism or Penance auras: Both save you a fair share of supplies. The Holy Wrench will save you some prayer points. (Optional) The TokHaar are very weak to Dreadnips. Dreadnips can also hit the Dills without your needing to use a pickaxe on them. Dreadnips are obtained via the Dominion Tower minigame. There are a few things you should note before attempting the Fight Kiln. Firstly, it is important to note that the Combat Triangle is in effect inside the Fight Kiln mini-game. Using Melee against an enemy weak to Range will result in your attacks doing half the damage they normally would. Thus, in order to save as much time as possible, and deal out the maximum amounts of DPS (Damage per second), it is recommended that the player tribrid, using a combination of Melee, Range, and Magic to ensure maximum kill speed. Secondly, the mini-game features 7 TokHaar-Jads, as well as a gigantic boss, Harrakken, who only appears for 72 seconds at a time. 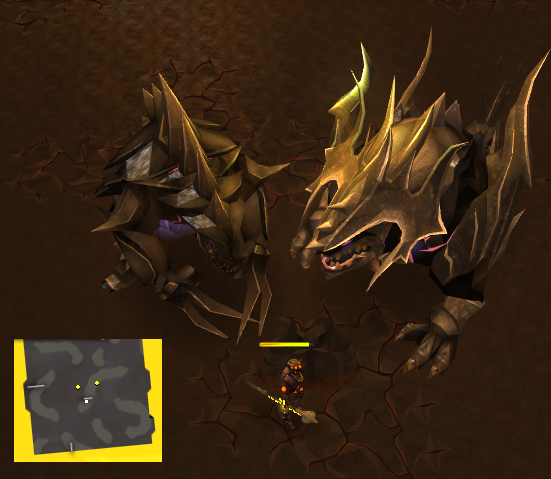 However, the Jads do not have their healers, as they do in the Fight Caves; they also have much fewer life points. Thirdly, many of the monsters in the Fight Kiln can be safespotted, however as the mini-game goes on, lava will slowly fill the cave, until only a small square of land is left. Lava fills the caves after waves 10, 20, 30 and 34. Invulnerability Complete invulnerability to all attacks except TokHaar-Ket-Dill's stomp attack for 15 seconds 1, 13, 25 YES! Restoration Fully restores your prayer and lifepoints 3, 15, 27 YES! Magic Boosts Magic by 50% for three and a half minutes, while greatly reducing the player's Strength, Defence, and Ranged 5, 17, 29 NO! Ranged Boosts Ranged by 50% for three and a half minutes, while greatly reducing the player's Strength, Defence, and Magic 7, 19, 31 NO! Strength Boosts Strength by 50% for three and a half minutes, while greatly reducing the player's Ranged, Defence, and Magic 9, 21, 33 NO! Constitution Boosts Constitution by 50% for three and a half minutes. 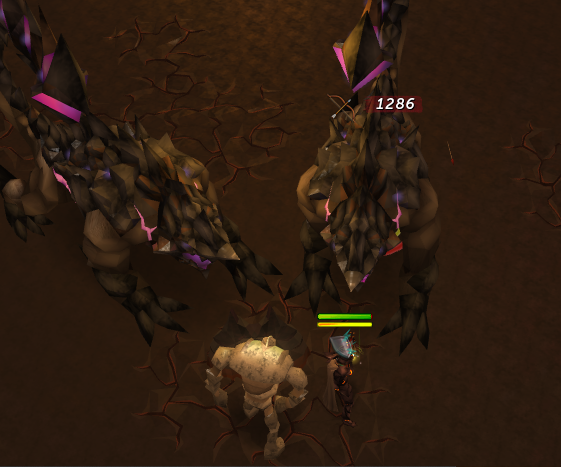 Affects (positively) the amount healed by the Bunyip, Unicorn Stallion scrolls, and Saradomin Brews 11, 23, 35 YES! Constitution crystals are very handy during Wave 28, and Waves 34 onwards. 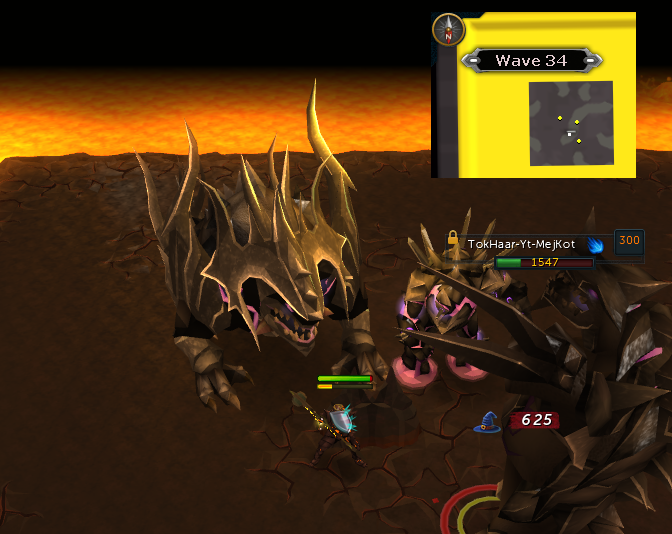 Invulerability Crystals are handy during Wave 35, when Jad spawns in such a way that he will be able to attack you NO MATTER WHERE YOU STAND. Restoration Crystals can save a few food and restores for the player. While the other crystals do increase your levels tremendously (At level 99, your magic level after using a crystal becomes 148), they seem to lower your accuracy, and are not worth using, considering they drain your defence considerably. As the Combat Triangle is in effect in the Kiln, it's highly recommended that you tribrid. Thus, the best gear to use would be the Hybrid- or All- tier. *Only use a Spirit Cape if you're using a Unicorn Stallion or an Iron Titan/Steel Titan. *Always prefer these over Scrimshaws in this setting, as they could save you hours of work. "Let's get this thing started!" The first few waves feature a lot of rangers in the form of TokHaar-Xil and TokHaar-Tok-Xil. 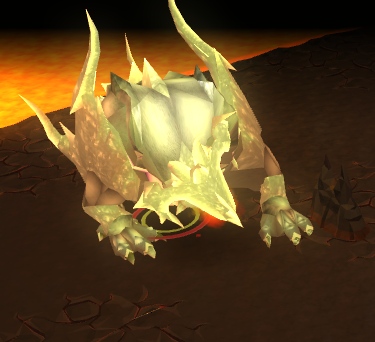 Use your Drygores on them, and allow your combat familiar to deal with the other monsters. Most people can finish these first few waves without using any food or prayer. The Invulnerability Crystal will spawn after you complete Wave 1. 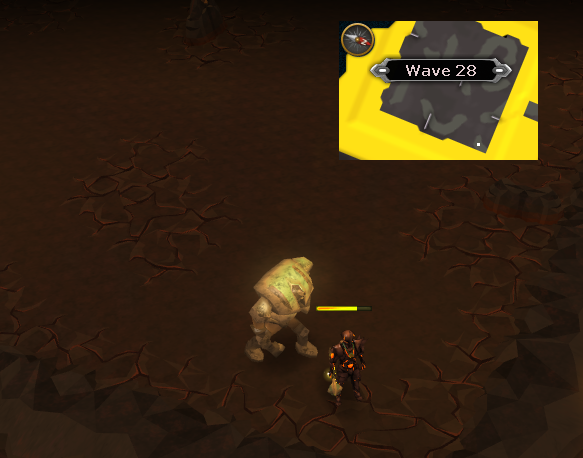 You'll only really find a use for it on Wave 35, with the Jad who can't be trapped. Pick it up if you feel like it, as a Constitution crystal should suffice for the Wave, and it would save you an inventory space. The Restoration Crystal will spawn on Wave 3. Always take these, as they can truly save your life, and save you quite a few supplies. 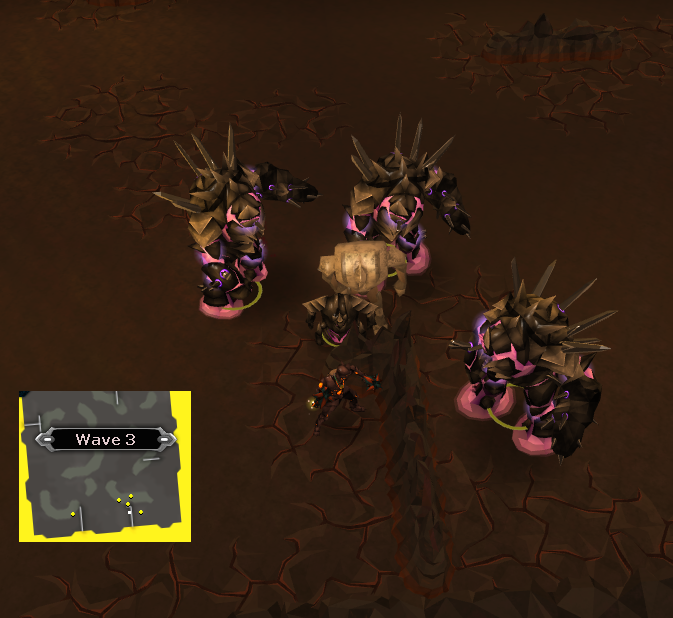 On Wave 10, your first Jad spawns. Don't panic. The version you'll be fighting is much easier than the one you've already fought in the Fight Caves. TokHaar-Jad doesn't spawn healers, and he only has around 8,000 life points. 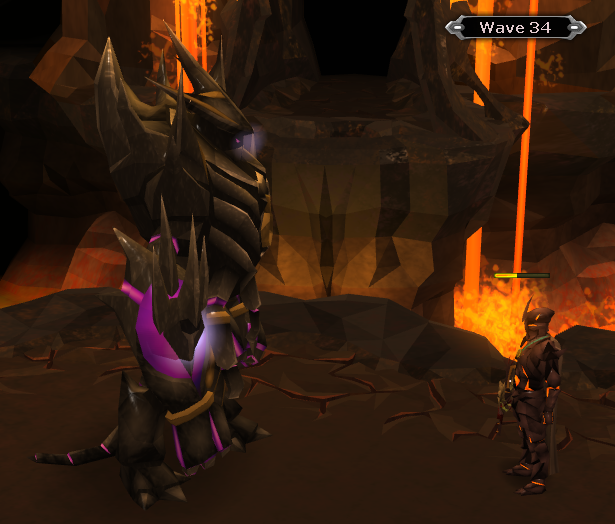 Whenever Jad spawns, you want to run to the North Eastern side of the Central Rock. 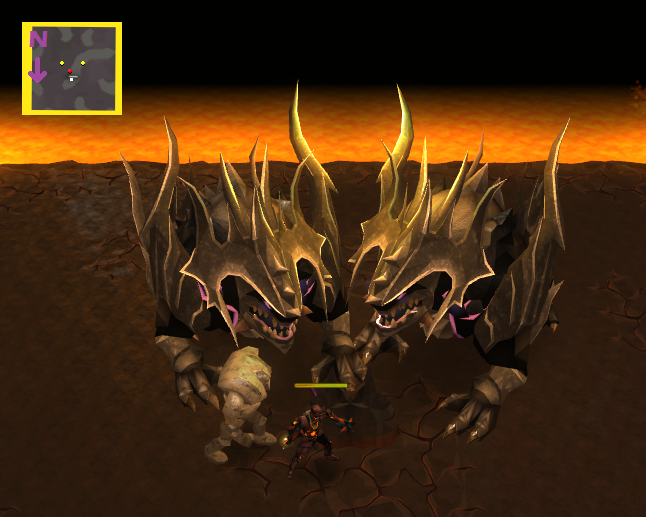 You will be facing 7 Jads throughout the entirety of the Fight Kiln; standing here traps 6 of them. Once Jad falls into place, ensure your prayer points are high enough, and kill him preferably with either Ranged or Magic. This way, prayer switching is less intensive. A few threshold abilities are usually enough to kill him. A cutscene will play upon finishing this wave. 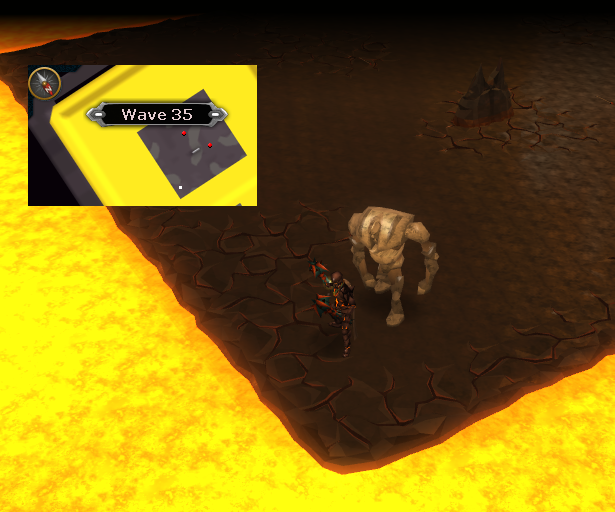 After this cutscene, lava will have filled the cave a bit, making the area smaller. These next few waves feature many TokHaar-Ket-Mej and TokHaar-Ket-Zek. Equip your ranged weapon, and begin the slaughterfest. Steel Titans are extremely helpful for these waves, as their special attack, Steel of Legends, is very accurate on all the Magic-based TokHaar. 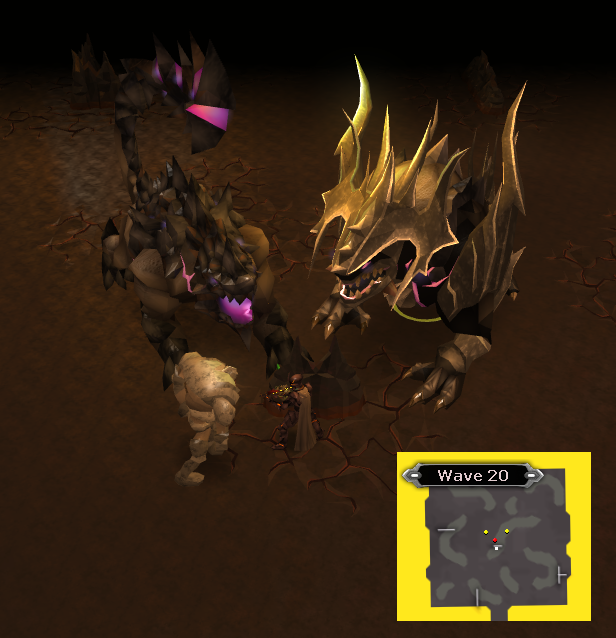 On Wave 19, a Tok-Haar-Ket-Dil spawns- the first of many. This creature is capable of dealing unblock able damage to you, by using its "Stomp" attack. The best way to take minimum damage against these is to set your Combat Familiar on them, and use dreadnips if you brought them. It's important to note that Dills cannot be harmed by conventional weaponry until its heavy shell is broken by a pickaxe (the one in your Toolbelt works now, after a Patch update.) However, Combat familiars and Dreadnips are able to bypass the Dill's protective shell, and if used correctly, save you quite some time when fighting these giant armadillos. 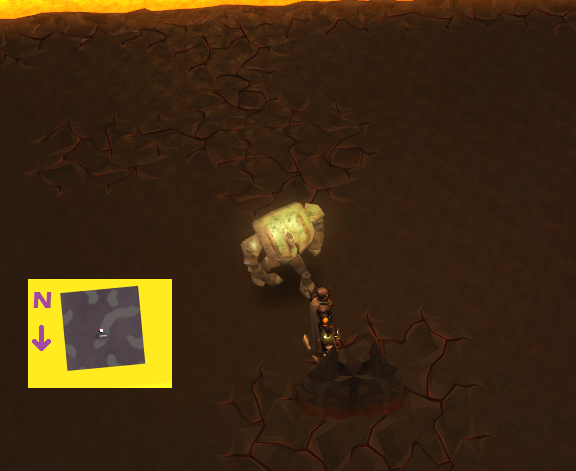 Another Jad spawns, but if you're in the correct position, he will be trapped behind the Central rock. Deal with him like you did last time. 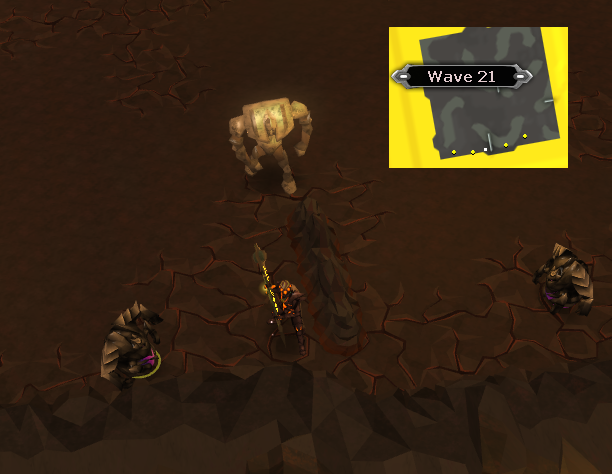 After you finish this wave, a cutscene will play, and more lava will fill the cave. This is among the most important waves of the Kiln, and often makes the difference between success and failure. 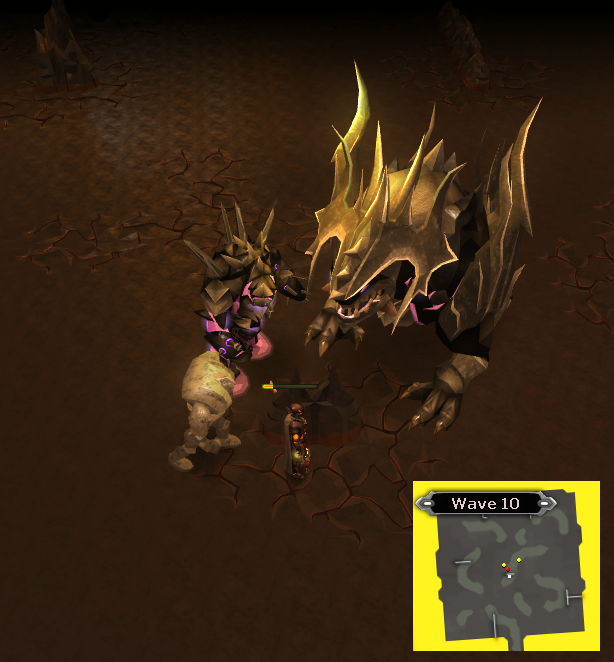 Most guides will tell you to run to the centre and attempt to trap all the Dills like you did Jad. DON'T DO THIS. Drawing the attention of every Dill in the room is not a good survival plan. A TokHaar-Ket-Dil will spawn directly on top of you, and will be the only thing attacking you. Take it out. Next, to your West should be a TokHaar Ket-Zek. Kill it yourself or have your familiar take it out; he's the least of your worries. Proceed in a counter-clockwise fashion; this ensures that you are never in combat with more than 1 Dill at a time, and dramatically increases your chances of survival. This wave shouldn't be too hard. 6 TokHaar-Mej-Kot will spawn, and you can easily take them all out with Magic. 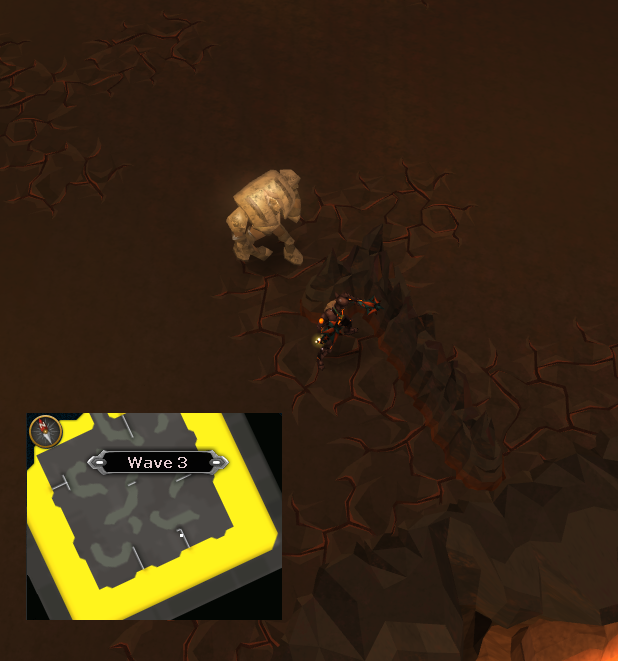 After this wave is done, return to your safespot in the centre of the cave, and prepare yourself. Good job on making it thus far. You have succeeded where thousands have failed. But now, the true challenge begins. 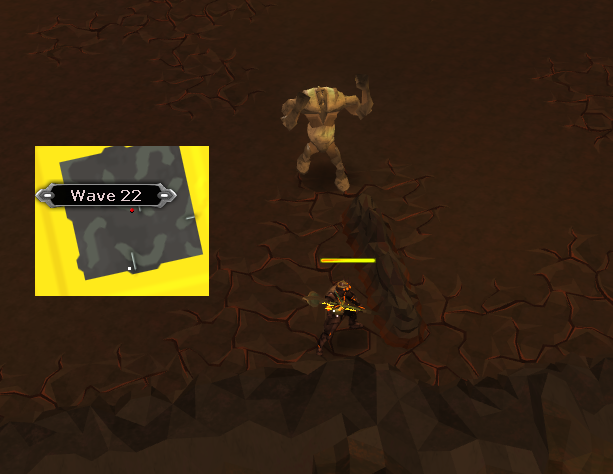 This wave features mostly Rangers, and thus you should use your melee weapons to maximum effect here. This wave will have several meleers. Introduce them to your spell casting abilities. This wave is full of Magers. Teach them to fear your crossbow (and your Steel Titan). Every wave from 34 onwards has a TokHaar-Jad. Thus, it is imperative you do not lose your calm. Activate a constitution crystal if you want, incase Jad gets a hit in. After the cutscene, you will spawn on the WRONG SIDE of the central rock. 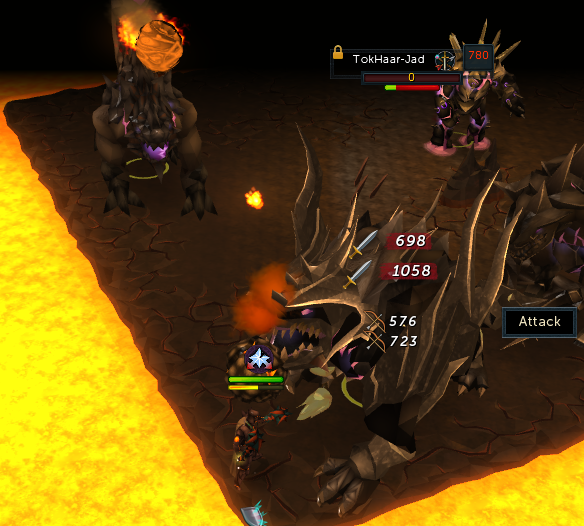 It's important that you run to the other side, or else Jad can get a lucky hit on you. When Jad spawns, take an invulnerability crystal, activate Turmoil and quickly kill Jad. You have 15 seconds to do around 7,500 damage before you need to start switching prayers. Now who said two heads were better than one? Harken only shows himself every so often for 72 seconds. For the rest of the fight, he will be submerged beneath the lava. Build your adrenaline on the tentacles around the Cave, and when you get 100, either activate Sunshine or Death's Swiftness, and begin killing him. 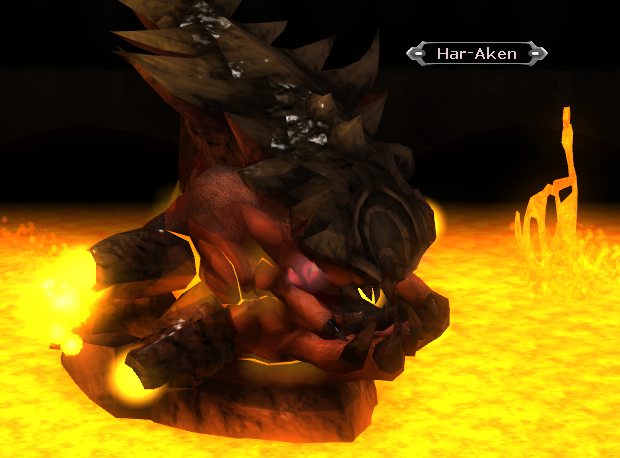 The real challenge with Har-Aken is that your max hit is reduced significantly. Thus it's not advised to use the Magic crystals on this wave, because surprisingly they decrease your accuracy. Use the Constitution crystal instead! You'll be kept alive for the entirety of the boss fight. Note: Ingesting/Applying Weapon Poison ++ before attacking Har-Aken causes him to get poisoned, and he will keep getting damaged even when he's not visible. 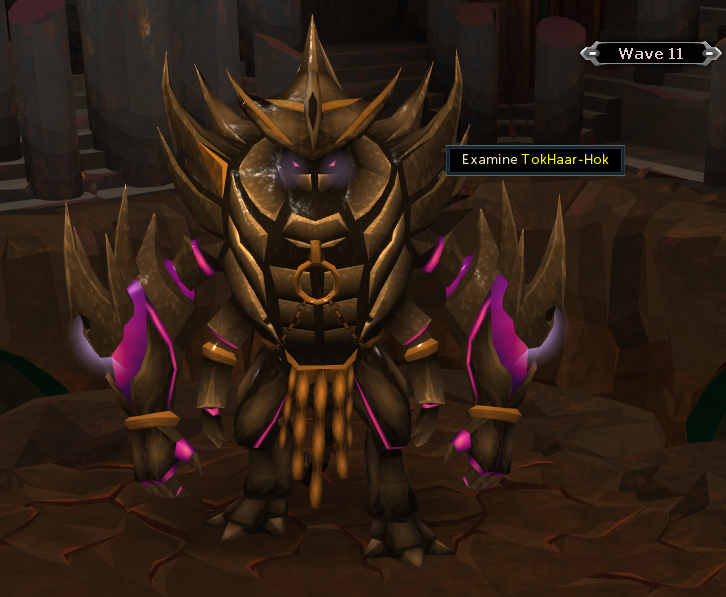 You can chose between a TokHaar-Kal cape and an uncut onyx. 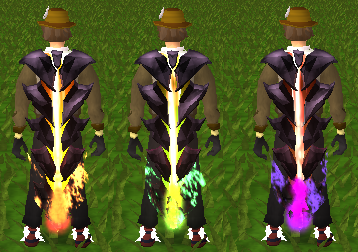 Unlike the old days, you cannot choose which cape you want, but you are offered the choice between an uncut onyx and the capes representing the attack styles you used to deal the most damage with. These are some of the best capes in the game. 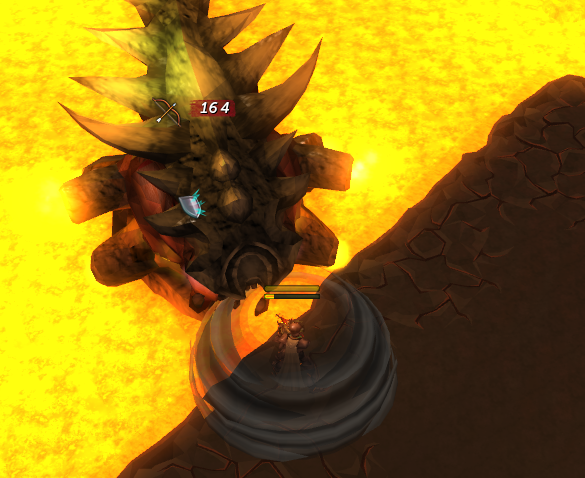 At any point during the Fight Kiln, should you wish to log out, you can do so. Simply click the log out button like you normally would. If done between waves, you will be logged out. If you forcibly close your browser window, you will either have died in the Kiln, or will have to repeat the wave you just completed. In conclusion, the Fight Kiln was a game-changing mini-game. Prior to its release, some players would desperately try to accumulate 2.7M tokkul so they could purchase an uncut onyx from the store in TzHaar city. The Fight Kiln remains among the best consistent, guaranteed money making methods in the entire game. "Jal-Yt, Within this Kiln flows sacred lava. Through it, we remain constant. If we are destroyed within this place, the lava rises and the Kiln forges us once more. Through this we are one... our memories shared by the lava. Existence as individuals is only ever... fleeting."